Dr. Courtney Amor is an Assistant Professor in the Department of Orthopedic Surgery at McGovern Medical School at The University of Texas Health Science Center at Houston (UTHealth). 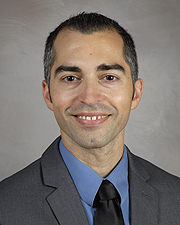 Dr. Amor specializes in treating disorders of the hand, wrist, elbow, and shoulder. This includes fractures, dislocations, tendon injuries, nerve injuries, arthritis, and sports injuries. He focuses on the optimal non-operative management for conditions that do not require surgery, and can sometimes offer arthroscopic or minimally invasive options when surgery becomes necessary. Dr. Amor is a member of several professional organizations, including the American Academy of Orthopedic Surgeons and the American Society for Surgery of the Hand.